1767-1832. He was born on 31 March 1767, the second son of the courtier and former M.P George Paulet, 12th Marquis of Winchester, and of his wife, Martha Ingoldsby. Paulet joined the service during the latter stages of the American Revolutionary War and fought at the Battle of the Saintes on 12 April 1782. After sailing for India in February 1789 with the Cornwallis Expedition aboard the Crown 64, Captain James Cornwallis, carrying Commodore Hon William Cornwallis’ broad pennant, he was commissioned lieutenant on 12 March and exchanged with Lieutenant Edward Oliver Osborn into the Phoenix, 36, Captain George Anson Byron, at Tenerife. Upon arrival in India he found that he was unable to obtain a return to the Crown and was promptly invalided home aboard the merchantman Houghton. In 1791 he was appointed to the Vulcan 8, Commander Solomon Ferris, and in the following year joined the Assistance 50, Captain John Samuel Smith with the flag of Rear-Admiral Sir Richard King, the commander-in-chief on the Newfoundland station. On 20 February 1793 Paulet was promoted to the command of the sloop Nautilus 16 which he recommissioned, going out to the Leeward Islands and serving in Vice-Admiral Sir John Laforey’s successful attack on Tobago. In the following year, having been posted captain on 9 January 1794, he served as the flag-captain to Commodore Charles Thompson aboard the Vengeance 74 during Vice-Admiral Sir John Jervis’ campaign in the Leeward Islands which commenced in January. After returning to England he commanded the Astrea 32 in the Channel from the summer of 1794, and whilst attached to Rear-Admiral John Colpoys’ squadron he captured the French frigate Gloire 36 after a five hour chase and fifty-eight minute action on 10 April 1795. 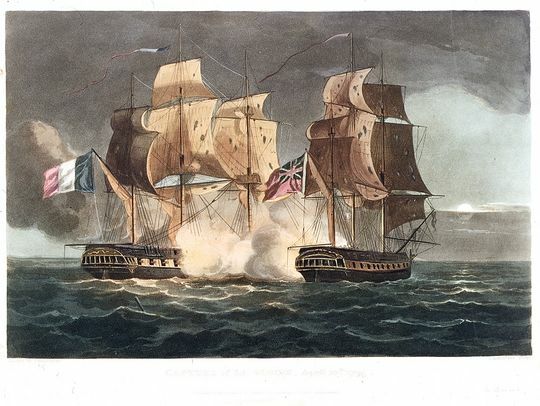 During the engagement his frigate lost all his topmasts but only suffered eight casualties, as opposed to the French frigate’s forty killed and wounded. Paulet continued in the Channel with the Thalia 36, being present at the Battle of Lorient on 23 June 1795. After cruising out of Plymouth through the autumn and winter of 1796-7, his command formed part of Rear-Admiral William Parker’s squadron that was sent to reinforce Admiral Sir John Jervis’ Mediterranean Fleet, although she was detached prior to the Battle of St. Vincent on 14 February. On 10 September the Thalia took the French corvette Espoir 16 in the Mediterranean, this ship being added to the Navy, and during this period she also captured several French and Spanish privateers including the Antoine 16 in March 1798. At this point here was a brief hiatus in Paulet’s career whilst he was brought to a court-martial on 12 June 1798 aboard the Prince 98 off Cadiz under the presidency of Rear-Admiral Sir Roger Curtis for striking Lieutenant Robert Forbes. The court returned a guilty verdict that saw Paulet dismissed from the service with a recommendation to His Majesty’s mercy, which was naturally received. He then briefly commanded the Caroline 36 during the winter of 1798-9 in a cruise to the Azores and the Canary Islands prior to Captain William Bowen assuming the command on his return from the Mediterranean. On 10 February 1799 Paulet joined the thirty-six year old Defence 74, serving off Lisbon and Cadiz, and in the Mediterranean following the breakout of the Brest fleet on 25 April. He was in the Channel under the orders of Rear-Admiral Sir John Borlase Warren during 1800, where his boats were active in inshore operations, capturing the Nochette and several gunboats at St. Croix on 11 June, and assisting in the destruction of the Thérèse 20 in Bourgheuf Bay on 1 July. On 2 April 1801 the Defence formed part of Admiral Sir Hyde Parker’s reserve division at the Battle of Copenhagen, where she engaged the Trekroner Fort at the end of the day. Returning to the Channel to meet the French invasion threat, Paulet’s command later took the privateer Enfant du Carnival 14 off the Portuguese coast on 28 September. She then joined Captain Charles Tyler’s squadron of four sail of the line that went out to the West Indies during 1802 to serve under Rear-Admiral Sir John Thomas Duckworth before returning home that summer. After fitting the Terrible 74 out at Plymouth in the autumn of 1803 Paulet commanded her in the Channel Fleet from the beginning of the following year, his ship earning a reputation for her high standard of discipline. She was attached to Vice-Admiral Sir Robert Calder’s force off Ferrol in 1805, and in the following year, having sailed to the West Indies with Rear-Admiral Sir Richard John Strachan’s squadron in pursuit of part of the Brest fleet under Rear-Admiral Jean Baptiste Philibert Willaumez, she was totally dismasted and almost lost in the hurricane that divided the French force on 18 August 1806. From 1807 and for the subsequent three years he commanded the Terrible in the Mediterranean and off Cadiz. Paulet did not enjoy another sea-going command bur became a colonel of marines in August 1811, was promoted rear-admiral on 12 August 1812, and joined the Board of Admiralty in 1813. He was created a K.C.B. in 1815, and left the Admiralty though ill health in 1816, being advanced to the rank of vice-admiral on 12 August 1819. Paulet died on 28 January 1832 at his seat of West Hill Lodge, Titchfield, Hampshire, after suffering for many years from a cancer that developed after an accident aboard the Terrible when he fell against a carronade slide He was interred in the family vault at Amport near Andover. He married Anne Maria Ravenscroft in October 1813 and had issue two sons and two daughters, his eldest son being created a baronet in his honour in February 1836. In 1813 his sister, the twice-widowed Hon. Urania Paulet, who at that time was the Dowager Marchioness Clanricarde, married Vice-Admiral Sir Joseph Sidney Yorke. An eccentric man who was known familiarly as ‘Harry’, on one occasion Paulet acceded to an order by the Admiralty not to go further away from his ship than his barge could carry him by strapping the boat to his carriage and taking off for London. He was regarded as a good seaman and a firm disciplinarian who looked to the welfare of his men, and who was generous in the amount of shore leave he allowed.